CAL: Happy birthday to Genie! How has Genie achieved such a milestone birthday? Lawrence: Genie has always been focused on “Building The Future” through collaboration and partnership. Our customers have been the most important part of our first 50 years. Growing from two employees, in founder Bud Bushnell’s garage in 1966 to more than 4500 team members worldwide in 2016. Operating in 80 countries and on six continents, today we are one of the top aerial work platforms manufacturers in the world. Over the last five decades we’ve helped build the industry with Genie Elevated Work Platforms (EWPs) being a major player in taking people safely to new heights. Genie has achieved this by continuously working to develop products that solve customer worksite challenges through innovation. CAL: In a competitive market, how do you stay relevant? Lawrence: By continually improving products, services and people while eliminating waste that customers are not willing to pay for. Genie’s product development is constantly looking for ways to provide new and innovative products that will increase customer ROI. This development involves customer consultation on requirements on jobsites and what rental rates can be charged for the features of the new products. Genie 360 Support is an example of Genie’s goals to improve our support of customers. Genie in Australia is also developing a strong culture of continuous improvement amongst our team members, which encourages everyone to look at ways to improve the current processes. CAL: Does innovation play a key role? Lawrence: Yes. Genie has been a leader in innovation throughout its 50-year history. Genie invented a number of new technologies each of which has revolutionised the industry. These include the dual parallelogram on small articulating booms and the X Chassis which enabled the SX-180 to be the first self-propelled boom to reach a height of 180 feet and still be easily transported on the back of a quad float trailer. Another innovation includes the Genie Fastmast boom system, which shortens the ground to top lifting time. CAL: What is Genie 360 Support? Service and maintenance – Genie field service based throughout Australia. The recent introduction of new maintenance intervals reduces the maintenance requirements for a number of boom and scissor lifts. CAL: How achievable is ROI in a competitive market like Australia? Lawrence: ROI is the biggest challenge facing our industry today and it is one which we must all work together to solve. The primary drivers of ROI are utilisation and rental rates and while national utilisation remains quite high, rental rates have probably never been lower. The US faced a similar challenge in their market a few years ago and to help deal with this issue, they decided to start reporting rental rates to an independent organisation that in turn would publish the rates. Having that information available in the market helped to drive rates up to the point where more than 50 rental companies now report rates on a monthly basis. Having more information available could also assist the local Australian market. As manufacturers, we can also help rental companies improve their ROI by designing products, which are innovative and built to a price point, which makes our customers money. CAL: Have the new products been received well by Genie customers? Lawrence: Recent product releases such as the Z-33/18 articulated boom lift, which is lightweight, compact and versatile have been well received by customers throughout Australia as it is well suited to tasks on sensitive floors or in restricted spaces. SX-180 telescopic boom lift the highest reaching self-propelled boom lift in the Genie fleet has been used on a number of major projects across Australia with excellent feedback from both operators and rental companies. CAL: What does the future look like for Genie in Australia and around the world? Lawrence: The future is full of challenges but also full of opportunities. Our industry is still relatively young compared to many other construction products and I expect over the next 10 years, we will see many new innovative products, which will make working at height safer and more productive. Our customers need more from us than just products. We need to be there for them throughout the whole product lifecycle and through Genie 360 Support that is exactly what we intend to do. To celebrate Genie’s 50th, the company revamped its GS-4390RT scissor lift which included a new coat of gold. 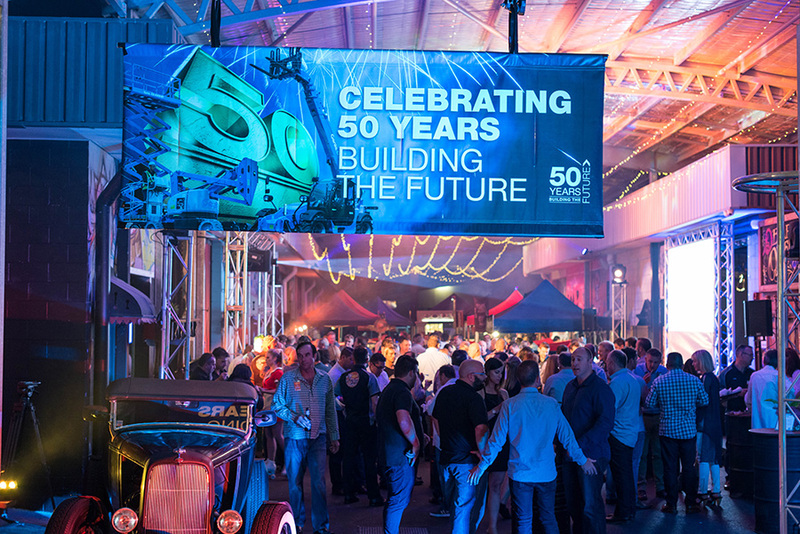 The revamped machine was revealed at the Genie Annual Customer Appreciation Night at the Miami Marketta on the Gold Coast in May.